The flight from Boston to Reykjavik/Keflavik was short (just 4 1/2 hours of actual flying time). But Iceland Air is more of a no-frills airline. Don’t get me wrong, Iceland Air is not cheap – far from it. They are actually EXTREMELY expensive for such a short flight. My tickets to Dubai were almost half what it cost to get to Iceland. And, like most low-budget airlines in Europe, they use those really cheap seats that are plastic and have almost no padding in them. They are the most uncomfortable seats I’ve ever had…ever. Unfortunately, when flying to Iceland, you really don’t have another choice…until Delta starts flying there next year. I think airline competition will do a lot to actually boost tourism in Iceland – bringing down costs and increasing quality. We arrived in Iceland at about 6:30am and headed to the Hertz rental car desk to pick up our vehicle, a 2 wheel-drive, 4-door Toyota Auris. We immediately headed out on the Ring Road (counter-clockwise). Our first stop was a gas station for some breakfast since Iceland Air doesn’t actually feed you once you’ve purchased one of their expensive tickets. Our first major stop was the Saga Center in Hvovlsvollur. The Saga Center is just what you’d expect. A museum dedicated to the Saga of Njall. Sagas are the narrative cultural history of the Icelandic people (similar to Shakespeare’s plays, although non-fiction). We found the Saga Center to be very confusing since we were new to the saga art form. They didn’t actually explain a saga until Room 16. However, despite its organizational challenges, we hung with it until the end and synthesized the information ourselves, so we had a strong picture of what was going on. After the Saga Center, we stopped down the street at the Eldsto Café. The Lonely Planet Guidebook mentions the service is a bit rude, but we didn’t have that experience. On the contrary, our server was a delightful young woman with terrific English skills. The food was also quite good (although portions were a little small). Relative cost for 1 cappuccino, 1 Pepsi, 1 omelet and 1 ham & cheese sandwich was about $30. After lunch, we continued out on the Ring Road and stopped at several waterfalls. The first two were Seljalandsfoss and Gljufurarfoss (on Route 249). You could only see the top of Gljufurarfoss and we did not hike up the stream into the small canyon for a better view. 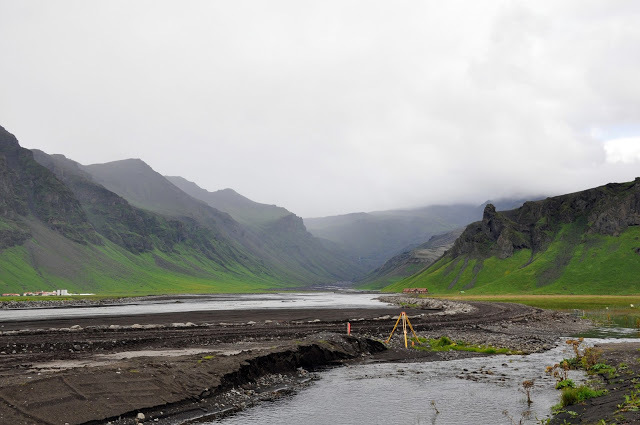 We drove on, stopping to take pictures of the Eyjafjallajokull volcano in the clouds and the river below that had become choked with sediment and ash from the eruption only four months earlier. After, we went on to Skogafoss waterfall in Skogar. 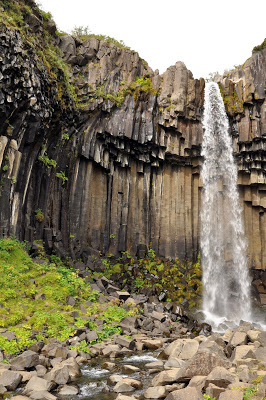 We found this one to be exceptional – and superior to Seljalandsfoss. 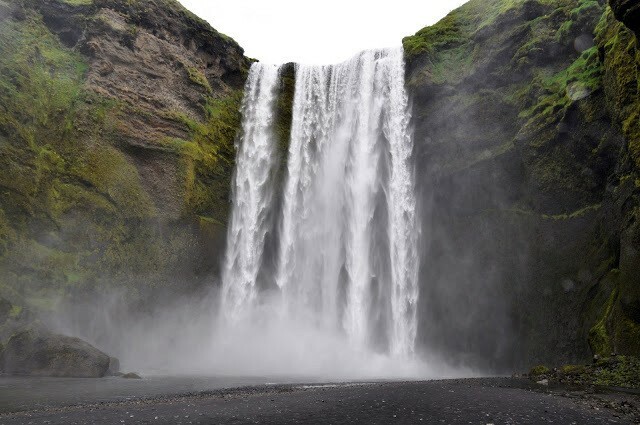 In fact, Skogafoss is probably one of our favorite waterfalls in all of Iceland and is definitely not to be missed. 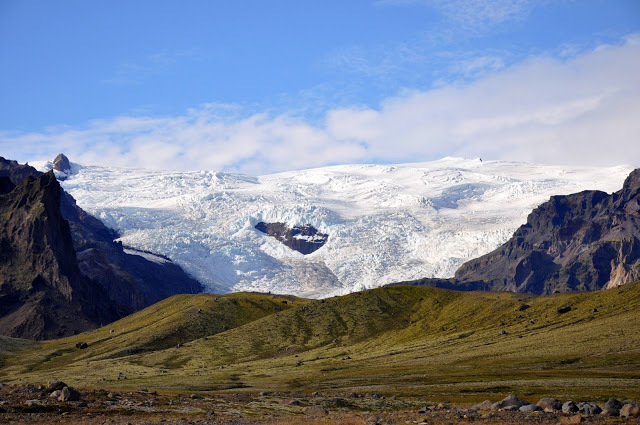 We headed just a few km down the road to Route 221 inland to the Solheimajokull glacier. 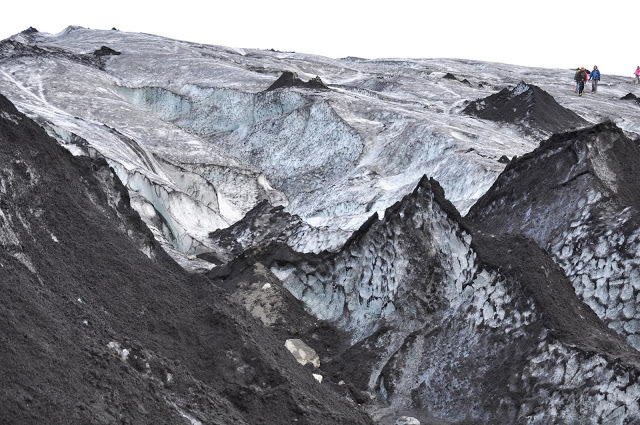 The is a beautiful glacier and you can drive to a parking lot approximately 1/2 mile from the base and walk up. Don’t be fooled by the pull-out about a mile up the road…this is NOT the parking lot. The drive was a little bumpy, but completely manageable in our 2-wheel drive Toyota. 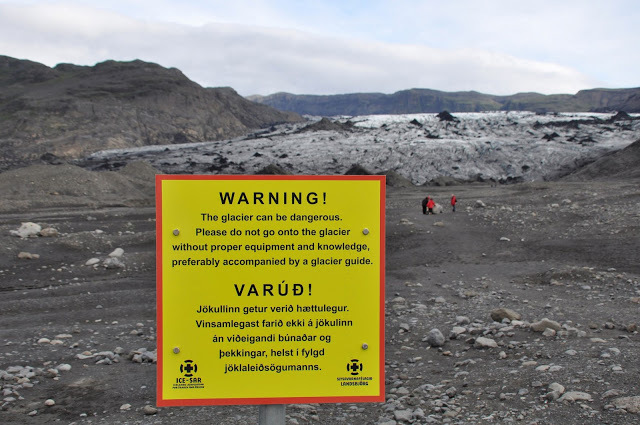 Once there, we walked a little on the lower levels of the glacier and took some photos. Unfortunately, Laura stepped in a muddy patch and sunk right in, so she was coated in mud up to her ankle. After the glacier, we drove south to Dyrhólaey. This spot offers wonderful vistas of the Southern coast, including natural rock outcrops, tidal pools and beautiful black sand beaches. While the road is supposed to be accessible in 2WD, we found it to be in such poor condition, that it almost merited a 4WD. Despite the jarring nature of the road, the views were worth the effort. We drove on into Vik and got settled into our hotel – the Country Hotel Höfðabrekka in Mýrdalur. This place was quite large and had dozens of rooms – all with paper-thin walls so we could hear all the yelling kids, the couple making love, the guy in the next room snoring and every car driving up the driveway. It was popular with parents, so there were lots of kids, who seemed to lack supervision. There were also a couple of tour buses staying there. The water, both hot and cold, had a strong sulfur smell. It wasn’t too bad for us, but some folks are really bothered by this. They had four hot pots (basically hot tubs with naturally heated water) in the yard, but they were only about 85 degrees Fahrenheit (maybe 30 degrees Celsius). Overall, the Hotel Höfðabrekka was OK, but could have been so much better and we probably could have done better staying at a different place. We backtracked the 5km into Vik in the evening to stop at the Vikurprjon – a knitting factory and outlet store. They have interesting souvenirs, but we did not partake. Note: In retrospect, we found that this shop had some of the BEST prices on woolen goods of any store we shopped at in Iceland. We didn’t want to purchase our souvenirs so soon into our trip, but we should have. Being our first night in Iceland, we wanted to keep it low-key, so we opted to have dinner at our hotel. They had a dinner buffet which featured many different options. Unfortunately, dinner was bad…really bad. I wished we’d gone down to the Grill attached to the gas station instead. For Euro 30, we had cauliflower soup, salad, and bread. There were a variety of mains, including whale in teriyaki sauce (more on that), overcooked trout, dry lamb, and lasagna. I skipped on the duo of horse. For dessert, I opted for the blueberry skyr – a traditional dish in these parts. It was very good – like a tart yogurt. So basically, it was an expensive dinner that was pretty bad. As it turns out, the Höfðabrekka was our worst meal of our entire trip to Iceland. Now, about whale. Laura and I don’t see eye-to-eye on exotic foods. We agreed on alpaca in Peru, but she refused to go along with the whale. I had been looking forward to it for a long time. Iceland is one of the few countries to engage in the practice, so I had high hopes. Instead of delicious red meat of the sea, I was treated to a chewy and pungent hunk of something that was unrecognizable as food. Not to my liking. But I am glad I tried it. Since all the food at the hotel was so bad, I probably should have tried whale at least one other place, but I didn’t. 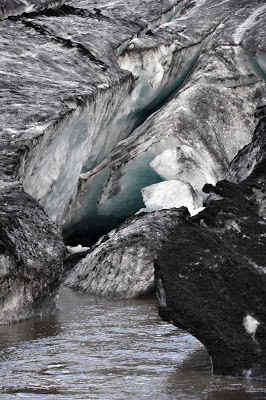 What do you think about The Waterfalls and Glaciers of Southern Iceland? Found you through TripAdvisor and am looking forward to reading the blog on Iceland – we’re looking at going in September. We recently completed a 10 day road trip around Iceland and as you can imagine, it was epic. 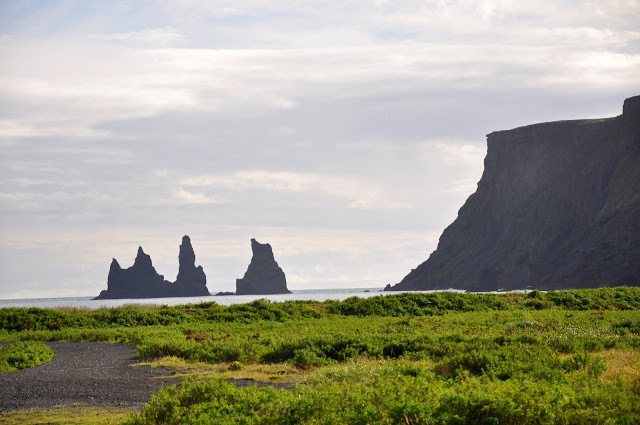 We still cannot get over the fact that there are so many beautiful natural attractions in Iceland. We really enjoyed the Myvatn area — lots of really striking and unusual natural formations, especially the boiling mud pits.